Life doesn't have to be boring, especially if you're driving the 2017 Ford Mustang. This legendary sports car injects plenty of fun into any drive, thanks to gripping dynamics. At the same time, it's still practical enough to use for everyday commuting and anything else you need. Since it first launched, the Ford Mustang has always stood for accessible performance. The car has a dedicated fan base for that very reason, and the 2017 model continues the tradition. You get to choose one of three available engines. The 3.7-litre V-6 has a more traditional setup while putting out a healthy 300 horsepower and 280 lb.-ft. of torque. For a more modern spin on things, select the 2.3-liter EcoBoost. It hits even harder with 310 horsepower and 320 lb.-ft. of torque, thanks in part to the twin-scroll turbocharger. Of course, the most potent option is the legendary 5.0-litre V-8 for the Ford Mustang GT. It rumbles aggressively and has 435 horsepower, plus 400 lb.-ft. of torque to back that up. The engine design means you enjoy nice power delivery throughout the RPM range. Add to the thrills with available performance features, like six-piston Brembo front brake calipers, launch control, electronic line-lock, and selectable drive modes. Each one helps you have a great time, whether you're on the road or track. 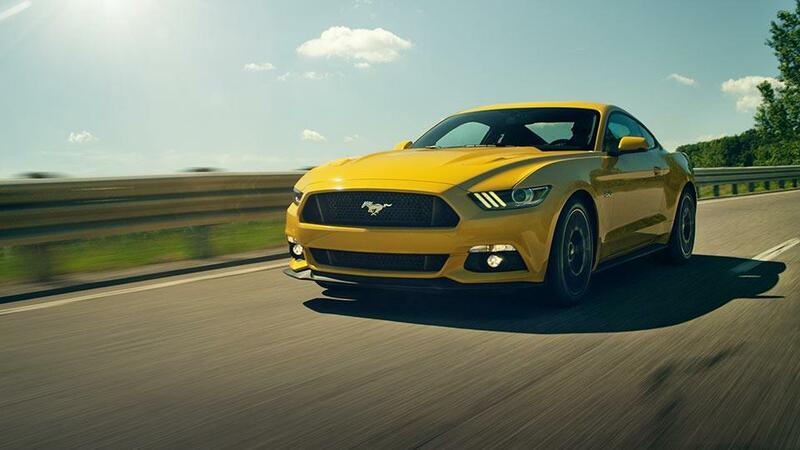 Sure, the Ford Mustang makes life more entertaining, but it also takes care of your safety. Ford designed the sports car to protect you in a crash, so you're always prepared. Even better, different technologies help monitor for dangers, either automatically addressing them or making you aware of the situation. One prime example is the available blind spot information system. Radar sensors detect when another car is in the next lane but doesn't appear in the side mirrors. Without this technology, you might change lanes and get in an accident. Thanks to indicator lights in the side mirrors, you know when the danger is present. Rear cross-traffic alert works in similar fashion, so as you reverse out of a spot, the system indicates if another car is approaching from either side. Adaptive cruise control teams up with rain-sensing wipers, so you can address changing conditions without doing a thing. As the driver, you just set the speed you want to travel, and the car maintains that speed until traffic ahead slows. It maintains a safe following distance until things clear up and then returns to the speed you set. You don't need to suffer for thrilling performance. Instead, the 2017 Ford Mustang interior has all kinds of comforts and conveniences that treat you right. Drivers can operate everything without obstruction. The shifter doesn't move too close to any controls in the dash. Cupholders are positioned well outside of the shift path. A thick steering wheel keeps you feeling in control, while ample seat bolsters and padding combat fatigue. Add to the comforts with optional features like seat ventilation/heating, leather upholstery, ambient lighting, and a premium sound system. Learn more about the 2017 Ford Mustang, plus take one for a drive by contacting Mont-Bleu Ford.